Amy Bock and Agnes Ottaway married on 21 April 1909 in Dunedin, NZ. Four days later Amy Bock was arrested at the Ottaways’ boarding house. She was convicted in the Dunedin Supreme Court on 27 May on two counts of false pretences and one of forgery, and was finally declared an habitual offender. The marriage was annulled on 17 June 1909. Was it a bid for “marriage equality” or not? New Zealand Police Museum online exhibition. March 2010. Amy Maud Bock (1859–1943) was born on 18th May 1859 at her father’s photographic studio, The City Photographic Establishment, 140 Elizabeth St. Hobart, Tasmania, to Alfred Bock and Mary Ann Parkinson, second daughter of Robert Parkinson of Hobart. They had married on 24th July, 1858. On May 18th, at her residence, 140 Elizabeth-street, the wife of Alfred Bock of a Daughter. Thomas J. Nevin was seventeen years old when Amy Bock was born. By 1863, now 21 yrs old, he would have been a friendly face to the four-year old toddler Amy while assisting her father Alfred Bock with studio portraiture in the glass house constructed at the back of the studio premises. It was located at the end of the laneway at 138½ Elizabeth-street. Thomas Nevin had established himself as a professional photographer within the Hobart cohort of photographers, especially with Samuel Clifford as well as Alfred Bock by 1864, and was operating principally from his studio at New Town, but on Alfred Bock’s insolvency in 1865 and departure from Tasmania in 1867 he acquired Bock’s negative stock, furnishings, studio lease, and glass house at auction and continued with the business under the same name, the City Photographic Establishment, 140 Elizabeth Street, Hobart until 1876. Alfred Bock’s (half) brother William Rose Bock was a teenager when he served more than two and half years as Alfred’s apprentice in the studio at the City Photographic Establishment, 140 Elizabeth-street, Hobart Town from 1863-1865. Alfred Bock was born on 19 April 1837 to Mary Ann Cameron nee Spencer and Alexander Cameron. William Bock was born on 5 January 1847 to Mary Ann Cameron nee Spencer and Thomas Bock. William Bock left Tasmania in 1868, returned in 1874 to marry his fiance Rebecca Finlay, and settled back in Wellington New Zealand where he thrived as an engraver, lithographic printer, medallist, stamp designer, and illuminator. He died in 1932. Alfred Bock moved his family from Tasmania to Sale, Victoria, in 1867 and to Melbourne in 1874. His first wife Mary Ann Parkinson died in Melbourne on 14th January 1875. The first five of their six children were born in Hobart. Alfred Bock married again to Eleanor Rachel Blackburn on 25th March 1882 in Melbourne. She was the granddaughter of architect James Blackburn. They moved to Auckland, New Zealand in 1882 where the three eldest sons of their seven children were born. But by 1887, Alfred Bock and family were back in Melbourne where they stayed until ca. 1906. Alfred Bock retired from business and moved to Wynyard, Tasmania where he died on 19th February 1920, survived by his wife and several of their children. 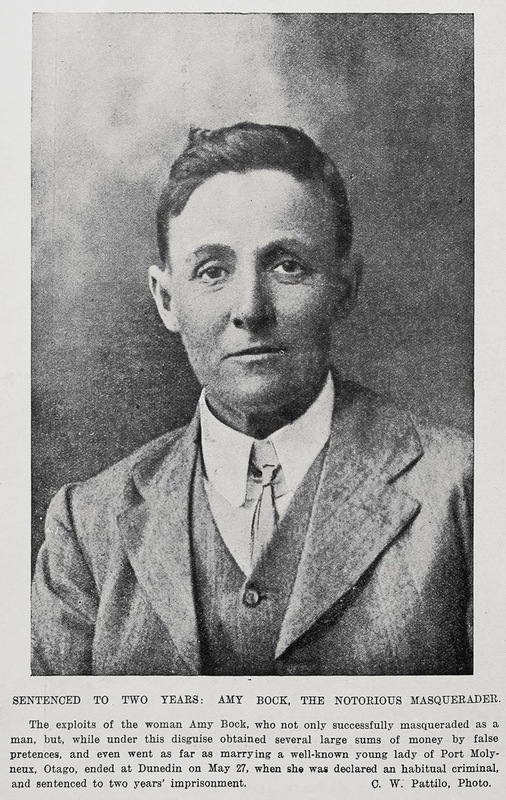 Alfred Bock’s eldest daughter Amy Bock found employment as a teacher in Gippsland, Victoria but in 1885 she was summoned for acquiring goods on false credit. Her father suggested she move to Auckland, New Zealand, where he was living with his second wife Eleanor Rachel Bock nee Blackburn. 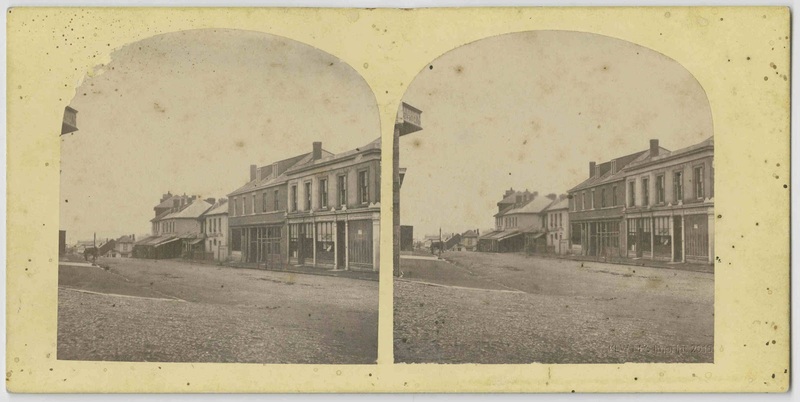 Amy Bock’s first officially recorded appearance before the New Zealand authorities was in April 1886 in the Resident Magistrate’s Court in Wellington, where she was charged with buying goods on credit in Christchurch and then disappearing. Remanded to Christchurch, she was sentenced to one month’s hard labour at Addington gaol. On her release she lived in Wellington, but by July 1887 she was back in court on fraud charges. She was sentenced to six months’ detention at Caversham Industrial School, Dunedin, where she so impressed the superintendent with her intelligence and ‘ladylike deportment’ that he offered her employment as a teacher. The position came to an abrupt end when she was discovered attempting to engineer her escape by forging letters from an affectionate but alas fictitious aunt. In January 1888 she left the school and advertised as a music teacher, but by April she was in court charged with obtaining goods on false credit and was sentenced to two months’ imprisonment. After her release she remained in Dunedin, later moving to Hill Top near Akaroa where she worked as a governess, before receiving concurrent six-month sentences for larceny and false pretences in April 1889. At the end of the year she returned to Dunedin where she found a job as a housekeeper until mid 1890, when she pawned her employer’s furniture. This time she received the maximum penalty: three years’ imprisonment with hard labour. 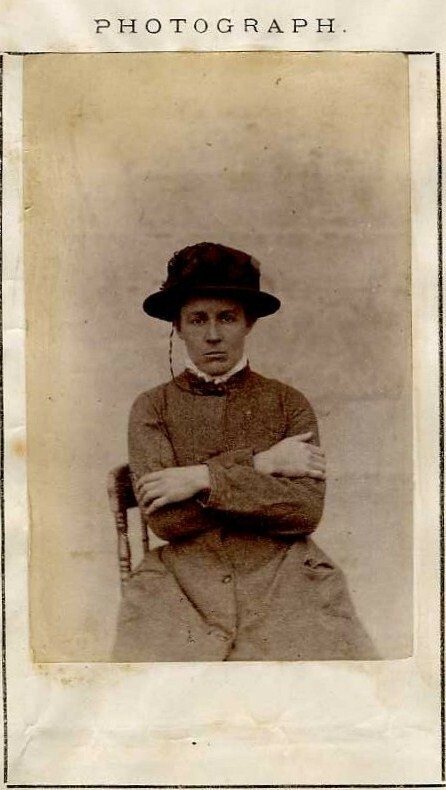 In October 1892 Amy Bock emerged from prison with £1 9s. in her pocket, some of which she spent on a ticket to Timaru where she fraudulently obtained £1. Discharged from prison in November, she joined the Salvation Army and lived with Army members in Timaru, but by Easter 1893 she was in trouble for selling her landlady’s watch. After serving her six-month sentence she moved to Oamaru, where she procured various trifling amounts of money, attempted to defraud a furniture vendor of a larger sum and was in prison again by January the following year. In 1895, after serving another three-month sentence for leaving a house owing board and lodging, Bock disappeared from official notice for several years. Some of this time she spent at the Magdalen Asylum for ‘fallen’ women, near Christchurch. 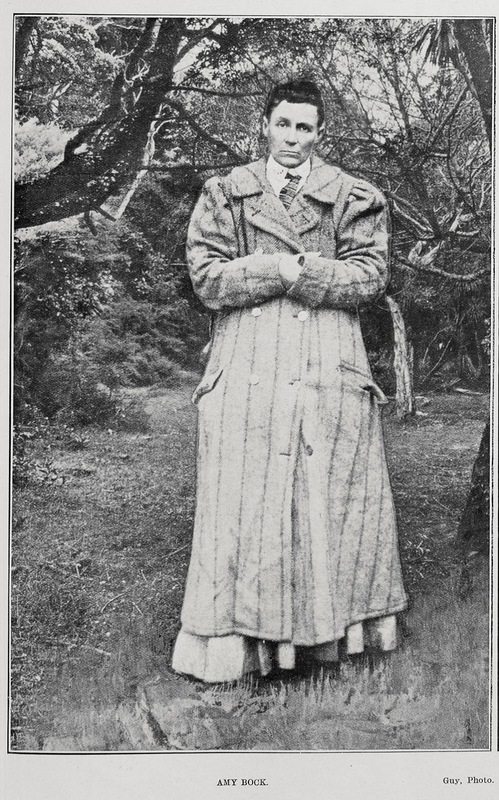 In 1902 she appeared in Christchurch as Molly (or Mary) Shannon, and through an elaborate deception which took her to Wellington and Auckland borrowed substantial amounts of money to finance the purchase of a poultry farm. This escapade earned her two years’ imprisonment in March 1903. 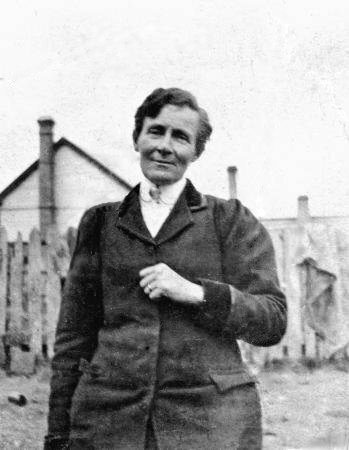 Late the following year, after remission for good behaviour, she found work at Rakaia, now using the name Amy Chanel, but in February 1905 she was charged with altering a cheque and given a three-year sentence. Source: Nichols, Chelsea. 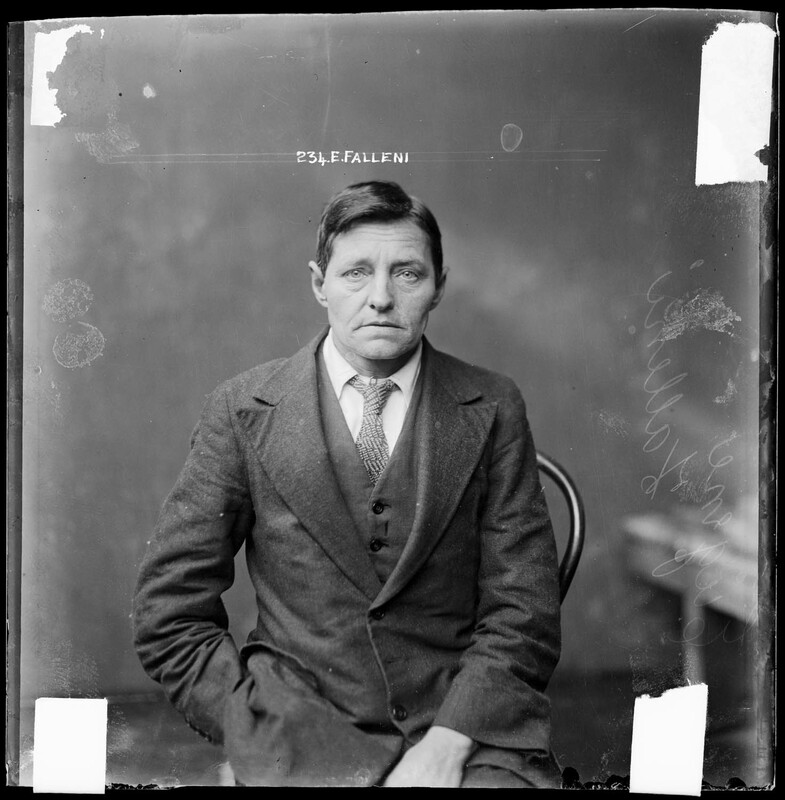 “Suspicious Looking: 19th Century Mug Shots in the Collection of the New Zealand Police Museum.” New Zealand Police Museum online exhibition. March 2010. In 1909 Amy invented the persona of Percival Redwood, a pipe smoking, well dressed man of small stature and high voice. Percy was a man of independent means – he owned shares in a North Island sheep farm – and was generous with his money, spending it lavishly on others – despite the fact that Bock was almost penniless. He made many friends in the small community of Port Molyneux in South Otago, including Agnes Ottaway, the landlady’s daughter. Agnes and Percy got engaged and it’s here that Percy’s world began to unravel. His funds ran out and he had to devise other ways to keep up appearances and his generous disposition. Agnes’s parents were a little suspicious of the new man in her life – but their worries were eased when letters began arriving from Percy’s mother reassuring them of her son’s financial position. Percy made up stories and borrowed money from friends and unsuspecting lawyers, bought an engagement ring on false credit and built lie upon lie to convince everyone of his status as a well–off man. Percy had to do some fast talking when the debtors came to call, and again when his ‘mother’ wrote to say the family wouldn’t be attending his wedding. Although suspicious, no–one said anything. The society wedding went ahead on 21 April 1909. At the altar Percy murmured his vows and kissed the bride before a large group of guests, including the local MP and the press. Afterwards they gathered in a large decorated marquee, the tables were laden with food and presents, there was speeches and dancing. The newly married couple were travelling to Melbourne for their honeymoon. But beneath the surface was a murmuring of discontent. The bride was subdued and kept her distance from her new husband, rumours were floating among the guests: the question on everybody’s lips was – where would Percy sleep that night? Percy didn’t get to sleep with his bride. The Ottaway family were suspicious about his claimed riches. He was told to bunk in the same room as the groomsman who was intrigued when the newly married man leapt into bed with his pyjamas on over his wedding clothes. The next day Percy claimed his mother was on her way down South and all debts would be repaid. The newly married man was given a week’s grace – but would not be sleeping with his bride before then. The wedding had taken place on a Wednesday – by Sunday the police were at the front door confronting Redwood with the words: ‘The game’s up, Amy!’ The giveaway had been a basket of women’s clothes found in a room at a Dunedin boarding house used by Redwood. Amy admitted all and was arrested for male impersonation and fraud. The national media went wild. Bock’s scam quickly became the object of jokes around the country. Postcards and a booklet The Adventures of Amy Bock were produced to capitalise on the interest in the case. The Ottaway’s were understandably shocked. Poor Agnes, horrified at the part she played in ‘New Zealand’s most notorious’ wedding quickly had the marriage annulled. She later married a ‘real’ man. Amy, who told the court she was 46, was charged with false pretences and forgery. She was declared a habitual criminal and sentenced to two years in the New Plymouth Prison. Photographs of Amy Bock were taken by Guy [?] above, and Pattilo, below. 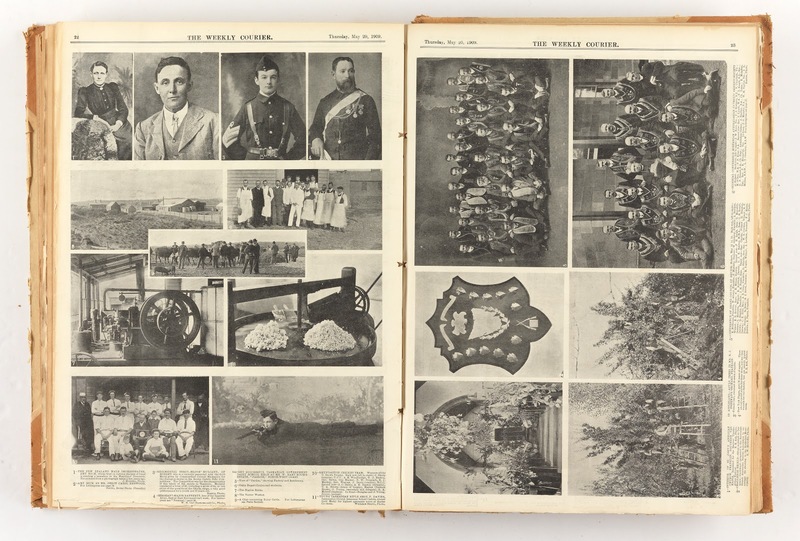 Tasmanian readers of the Weekly Courier, 20 May 1909 were provided with the Pattilo photo, Amy Bock as Percy Carol Redwood, and another earlier photo of Amy Bock, Photos 1 and 2 top left on page 22. AMY BOCK SKETCHED IN THE DOCK IN THE DUNEDIN CITY POLICE COURT. In New Zealand, Amy Bock’s life has been the inspiration for plays, books, a television program, a photographic exhibition, a musical composition, and more. Mad or Bad? is the first full-length biography of Amy Bock, New Zealand’s most notorious female criminal con artist. Born in 1859 in Hobart, Tasmania, Amy had a convict heritage on both sides of her family. She gained notoriety in 1909 for her impersonation of a man – Percy Redwood – and married an unsuspecting woman. Author Jenny Coleman shows how Amy’s whole life was one of fraud and misrepresentation. After teaching for six years in Victorian schools until she was asked to resign, Amy migrated to New Zealand in 1884. Assuming a variety of personae and remaining conveniently itinerant, she pursued a consistent course of petty crime for the next 25 years. 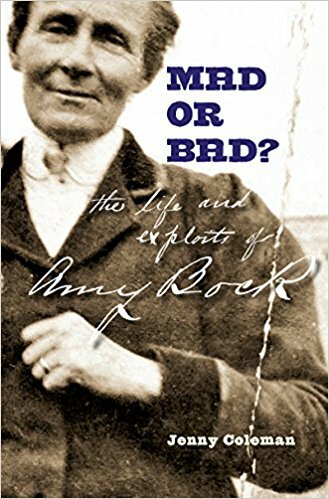 In presenting her colorful and checkered life, this well researched biography leaves the reader to judge whether Amy Bock was essentially mad or just bad. Notice here that the author of this synopsis mentions the Tasmanian convict heritage “on both sides of her family” of Amy Bock as if it would have contributed sui generis to her criminal behaviour. Note also that the woman whom Amy Bock married is characterised as “unsuspecting” in this synopsis. Neither claim, surely, can pass as reasonable to readers in 2010, the year the book was published. Title: Eugenia Falleni, alias Harry Crawford, special photograph number 234, Central Police Station Sydney, 1920. Creator: New South Wales. Police Dept.